After interacting with thousands of writers through college teaching, speaking engagements, and workshops across the country, Lisa understood the reason people didn’t write their stories: They simply didn’t know how to begin. Every writing book on the market told them what they should do to create a story, but few offered instruction on how to do it. With that in mind, Lisa wrote down the techniques she had for years used to help writers get their memories onto the page in story form. The core of her book defines and illustrates the iconic memories she calls “shimmering images.” It goes on to help people identify those memories and capture the stories that surround them. 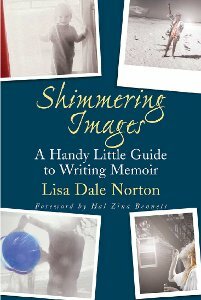 In Shimmering Images you learn a simple way to put together a memoir. Buy Shimmering Images. Click here. Click here to read excerpts from Shimmering Images.